Hybrid dynamic systems include both continuous and discrete state variables. Properties of hybrid systems, which have an infinite state space, can often be verified using ordinary model checking together with a finite-state abstraction. Model checking can be inconclusive, however, in which case the abstraction must be refined. This paper presents a new procedure to perform this refinement operation for abstractions of infinite-state systems, in particular of hybrid systems. Following an approach originally developed for finite-state systems ,, the refinement procedure constructs a new abstraction that eliminates a counterexample generated by the model checker. For hybrid systems, analysis of the counterexample requires the computation of sets of reachable states in the continuous state space.We showhowsuch reachability computations with varying degrees of complexity can be used to refine hybrid system abstractions efficiently. A detailed example illustrates our counterexample-guided refinement procedure. Experimental results for a prototype implementation of the procedure indicate its advantages over existing methods. This research was supported by the Defense Advanced Research Project Agency (DARPA) MoBIES project under contracts no. F3361500C1701 and F33615-02-C-0429, by the Army Research Office (ARO) under contract no. DAAD19-01-1-0485, by the National Science Foundation (NSF) under grants no. CCR-0121547 and CCR-0098072. The views and conclusions contained in this document are those of the authors and should not be interpreted as representing the official policies, either expressed or implied, of DARPA, ARO, NSF, the U.S. Government or any other entity. 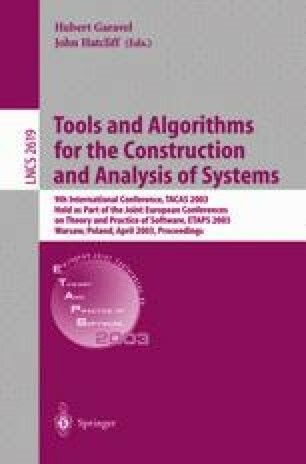 Clarke, E., Fehnker, A., Han, Z., Krogh, B., Ouaknine, J., Stursberg, O., Theobald, M.: Abstraction and Counterexample-Guided Refinement in Model Checking of Hybrid Systems. Technical report CMU-CS-03-104. Download from http://www.cs.cmu.edu/~theobald.